Well, firstly, in an art world increasingly dominated by biennales, art fairs and the like, there is the question of nationality and its relevance or otherwise in this context. The national pavilions in Venice (and France and Germany have exhibited in pavilions facing each other in the Giardini for more than a century) usually showcase the art of the countries that occupy them – ownership varies: Germany owns its pavilion, France leases its building from the Biennale (I think) – so for the German pavilion to be in the French pavilion and showing work by non-German artists is more than a little confusing. And it’s not just Ai, of the four artists exhibiting here, none js German, though one – French-Iranian filmmaker Romuald Karmakar – is German born. Bang poses more interesting questions though. 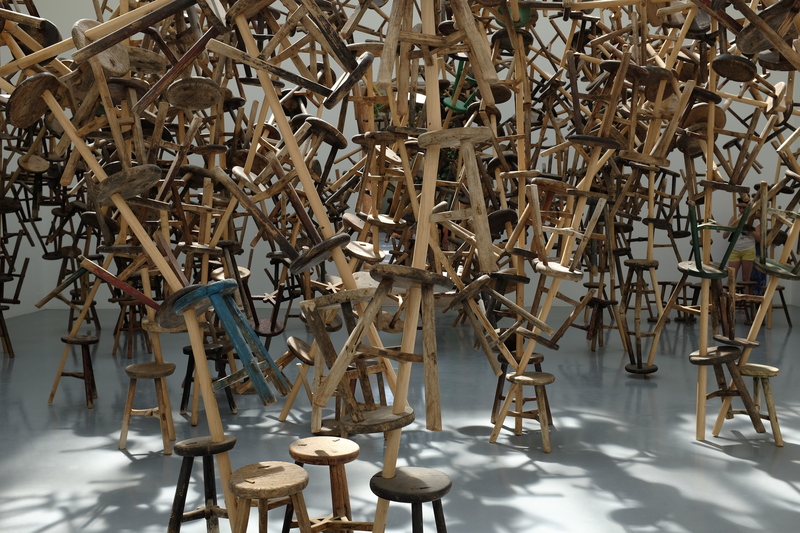 Visually the work is stunning and there is a lot to be said for simply walking in amongst the chaos of almost a thousand, now conjoined, stools appreciating the form of the installation. 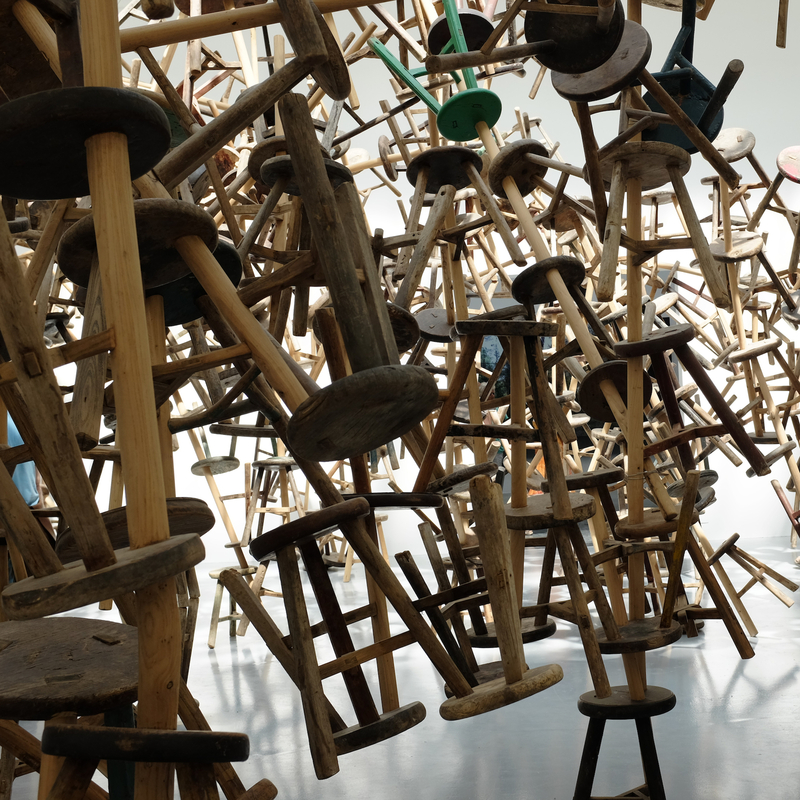 But this is Ai Weiwei. There is always more going on than might at first sight be apparent. Ambitious though Bang is as an installation, what’s more interesting is the message, the politics of the piece. 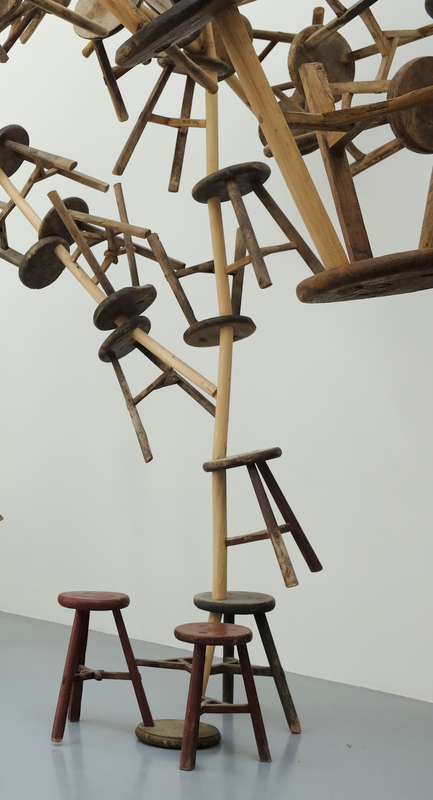 The stools are, of course, just stools. In a way, that’s the point. They are all the same, all 886 of them. But they are also all unique, each carrying the traces of its own history as well as signifying he wider cultural history of China. Three-legged wooden stools like this were once ubiquitous in China: every household had at least one. They served all sorts of purposes and lasted well enough to be passed on through the generations. But with the modernisation that followed the Cultural Revolution, stools like these were gradually superseded by ones made of aluminium and plastic. The use of what are now antique artefacts as the building blocks of contemporary sculpture is a recurring strategy in Ai’s work, used to examine the sweeping away of the past that characterised the Cultural Revolution and the on-going destruction of the old to make space for the new as the country relentlessly marches to the drum of progress. Unlike some of the artefacts Ai has used in his work – neolithic vases, for instance – the stools are not rare and individually precious. But they are significant and their use here seems to ask that we think about the individuals as well as the crowd. 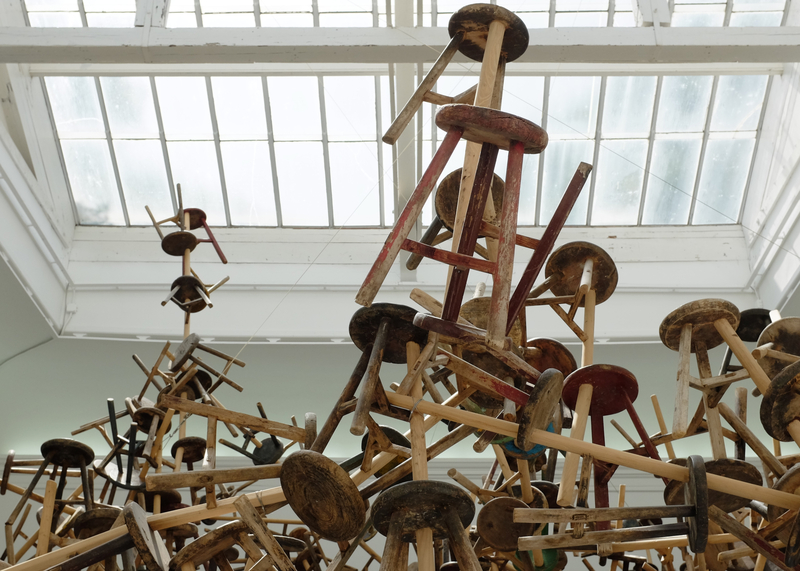 This entry was posted in Assemblage, Installation, Sculpture and tagged Ai Weiwei, art, assemblage, Bang, German Pavilion, installation art, politics, sculpture, three-legged stools, Venice, Venice Biennale by Ann Jones. Bookmark the permalink. Wonderful review and images… gives one an opportunity to have access to work like this. Maybe next year I will get to the Venice Biennale; it’s been a goal of mine for years, and reviews like this will help fuel the fire for me! Thanks and I really hope you get there! I have become a bit of a Venice addict these last few years. It’s an amazing place and the biennale is a great opportunity to see loads of contemporary art and explore the city. I’ve also written a couple of Venice pieces for MostlyFilm.com: http://mostlyfilm.com/2013/12/06/biennale-2013/ and http://mostlyfilm.com/2011/08/16/glimpses-of-the-2011-venice-biennale/ which perhaps give a better sense of the event as a whole and the way it inhabits the city.